The Ravens find themselves faced with a critical division game this week, as they begin a tough 3-game road trip in Cleveland and the Browns team they will find there is playing in stark contrast to the one that visited B’More in week 3. Cleveland has won 3 of their past 4 games, with victories over the Bengals, New York Giants, Jacksonville Jaguars, and a near miss in Washington since the Ravens handed them a 28-10 purple pounding on September 21. They are well aware that a victory Sunday would tie them with the Ravens for 2nd in the AFC North, and with a Pittsburgh loss in Washington, put them just 1 game out of the division lead – not bad after an 0-3 start. The stakes are, of course, equally high for the good guys. If the Ravens can pull off just their 3rd road win in their last 12 tries, a Pittsburgh loss would find them tied for the division lead after Week 9, a very improbable scenario given preseason expectations. It will take a lot more than hope and good feelings to get the win in the Dog Pound Sunday, though. Quarterback Derek Anderson has been extremely inconsistent in 2008, and his team’s fortunes have rose and fell like the recent stock market with DA’s game. When Anderson is good (as he was against the NYG – 18 for 29, 2 TD, 0 INT), he is very good. When he is bad (like in Washington – 14 for 37, 1 TD, 0 INT – or in Baltimore – 14 for 37, 1 TD, 3 INT), he looks like he couldn’t hit the broad side of a barn, and has no business being in the NFL at all. Which Anderson will show up on Sunday? The Ravens, still playing with a depleted secondary, had better hope it is the bad DA; unfortunately, he seems to be much better at home. Although they still have just the 30th ranked offense in the league, the Browns can explode for 30 points at any time – and they have the weapons (much like, gulp, the Colts) to expose the Ravens deep. Jamal Lewis will be amped up to play his former team, as he always is (you think he doesn’t want to be the one to break the Ravens consecutive non-100 yard rusher streak? ), but the Browns would be well-advised to go to the air early against B’More, who will be again playing without C-Mac or Dawan Landry. Samari Rolle is said to be a game-time decision. 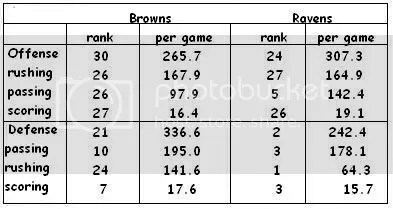 The Browns have improved defensively as well, although their 21st ranking doesn’t really show it. The more important statistic is their 7th-ranked scoring defense. They are taking the “bend-but-don’t-break” philosophy to new extremes. To have such a difference between the amount of yards you are giving up and the amount of points surrendered points to a very strong red-zone performance. For the Ravens to pull off the upset (they are 1.5-point underdogs), they will have to put the ball in the red zone when they get the chance. Controlling the clock is important against an offense like Cleveland’s, and the Ravens are currently #1 in the NFL in time of possession, but 7-8 minute drives followed by field goals are not going to get the job done. We’re going to need touchdowns – if the defense or special teams can contribute one, we’ll certainly take it. Will we see more trick plays this week? Cam Cameron’s “Wild Bird” (can we please, PLEASE not call it that?) offense lit up the Oakland Raiders like a Christmas Tree (or Haunted House strobe light? ), but those kinds of plays don’t work for long in the NFL. It’s going to take lining up, man-to-man, and winning their match-ups for the Ravens this week. Jason Brown will have his hands full against Browns DT Shaun Rogers, who has really stepped up his game in recent weeks. We fully believe JB is up to the challenge, but he will certainly earn his pay in this one. The Browns have also gotten SS Sean Jones and WR Donte Stallworth back from injuries since we saw them last – 2 playmakers who can have a big impact on the game at any time. And of course, there is the ever-present threat of return man Joshua Cribbs to contend with. All that being said, the fact remains that the 2008 Browns have yet to put together back-to-back strong games. Joe Flacco has not turned the ball over at all since Indianapolis, and the Ravens defense, even with their injuries, is the best in the league right now (I don’t care what the stats say, I’ll take our D over shitsburgh’s any day). The Browns will move the ball, but Ray and the boys will keep them out of the end zone when it matters most. We’re picking the Ravens in a nail-biter. This entry was posted on October 31, 2008 at 8:56 am and is filed under Ravens, Ravens Game Previews. You can follow any responses to this entry through the RSS 2.0 feed. You can leave a response, or trackback from your own site. Contrary to popular belief, I actually have a life outside of football. I just checked the calendar and noticed today was Halloween. Happy Halloween to you and your staff. you have the rushing and passing categories mixed up. I heard a bunch of people on the radio talkin about it, calling it the “Wild Bird.” I did hear Harbaugh call it the Suggs package though. Yeah, i just checked the baltimore ravens website its called Wild Bird there too… Im sticking with Suggs package which is what i heard the COACH say.